Adam Gretler has been a patient at Rady Children’s since the day he was born. He endured gastrointestinal surgery as a newborn, and not long after his discharge from the NICU, he began experiencing physical and behavioral delays that led to an autism spectrum diagnosis. He requires speech, occupational and physical therapy, as well as Applied Behavioral Analysis (ABA) therapy each week. What’s more, the 7-year-old has undergone additional complex gastrointestinal and heart surgeries. Today, Adam is a sweet-natured, articulate second-grader who loves baseball and Legoland. His parents look forward to the day when Adam can enjoy life free from the constraints with which he is currently challenged. 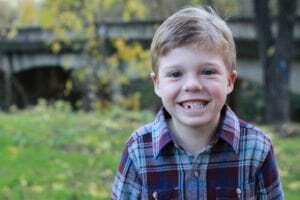 Your gift to Rady Children’s through Children’s Miracle Network Hospitals will help advance pediatric clinical and translational research and allow us to continue to improve and save the lives of children like Adam. Thank you so much for your vital support!